Here's another valuable item that not everyone recognizes, the Blade of Wizardry. What makes this weapon valuable is it's looks, and looks alone. It's a epic level 70 world drop from TBC zones and people are ready to pay ridiculous amounts of gold for it! I made another post today, so don't miss that one either! Your opinions are needed there! Is Black Temple your lucky zone? Much like the previous valuable item, the Teebu's Blazing Longsword, this one cannot be farmed either, unless you count auction house farming. Highest recorded drop rate is 0.04% from an elite in Black Temple. This means it can drop anywhere, as long as you are in a high level Burning Crusade zone, preferably a raid or a heroic dungeon. How you should approach this method stays the same. You should add this to the items you look out for while at the auction house. It's not likely, but sometimes people sell items like this for just a few hundred gold. When you see a cheap deal like that, you flip the item, relisting it for.. let's say 99k gold! I'm not sure what people are ready to pay for this one, I have no personal sales sadly. But I've heard stories of even 100k gold paid for one, but I cannot verify any. Where can I farm Blade of Wizardry? It's sometimes a good idea to farm world drop items, but only if you do it in a zone that is profitable to farm anyways, like most raids. So there's no harm done if you want to try your luck and go clear Karazhan for example. Just click on the Loot Hunters tab on the left and see what else Karazhan holds! I still haven't made a Loot Hunters post about SSC or BT, so I guess I will have to tackle those at some point so we can all see what those hold, besides shiny world drop epics! Farming for the ever elusive "lightsabers" is not a bad deal, but if you want to get your weapon looking like a lightsaber, but without having to use item then you might want to go to The Slave Pens, and from Mennu try and get the Spellfire Longsword. Demand is highly dependent of your server and/or finding the right buyer. 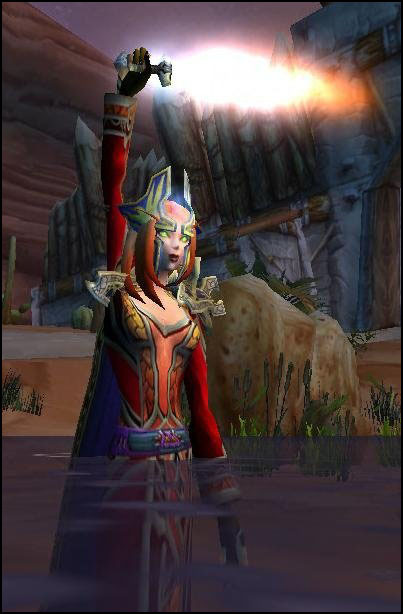 Teebu's Blazing Lightsword has been around since before TBC. It actually drops almost exclusively from mobs in Blackrock Mountain. I remember wanting one over 6 and a half years ago. Isle of Quel'Danas is indeed a good place to farm with all the high level mobs around and short respawn times. It's also like instance farming since there's usually no one there stealing your kills. On top of that you can combine it with quests if you want to get exalted with Shattered Sun!